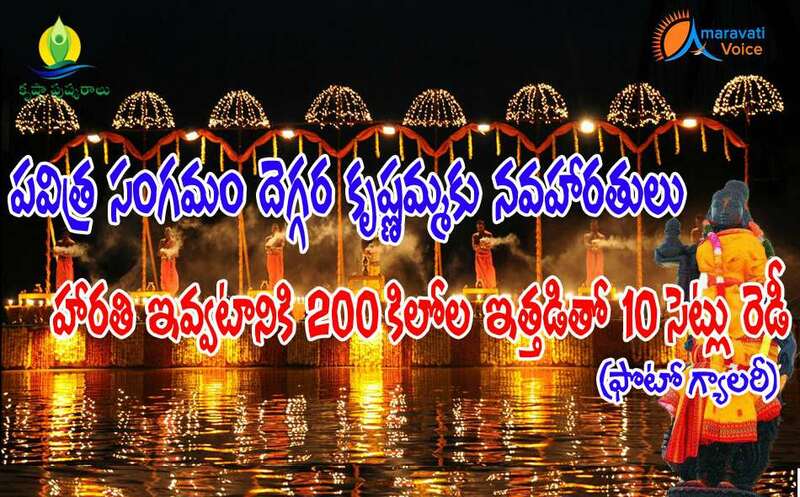 With the inspiration of Godavari Haarathi in Rajahmundry, government is planning to start Krishna Nitya Haarathi at Krishna River. This is going to be done every day from Pushkarams, near Pavitra Sangamam, in Ibrahimpatnam, where Godavari water meets Krishna. The priests would be on a floating Platform and give the nine haaratis. Below are the sets, from which the nine aarthis would be given. A total of 10 sets are prepared, with a cost of Rs.18.5 lakhs. These are prepared by Sri Sarvani Industries Arts and Crafts, they have handed over these to Durga Temple authorities.